The latest news from the EPA on light-duty vehicle fuel economy and greenhouse gas emissions is…complicated. There’s good news and not-so-good news, and the array of factors that figure into EPA’s accounts of these matters is mind-boggling for those not tuned into the fine points. This year, the agency simultaneously released its annual report on trends in automotive technology, carbon dioxide emissions and fuel economy, and the arcane (but important!) tally of how manufacturers are doing in meeting greenhouse gas emissions standards. Various credit provisions and other features of the standards regimes make it tricky to relate the data on actual performance to the ins and outs of regulatory compliance. We’ll stick to the greenhouse gas emissions compliance data here, but the story for CAFE standards will be similar. For model year 2014, as in the two years prior, the auto industry met greenhouse gas emissions requirements with room to spare. The figure below compares the average emissions required (orange) under the standards with the average emissions achieved (blue), which are lower (better) by a good margin. There’ve been many assertions that growing sales of larger vehicles spell trouble for the increasingly stringent fuel economy and emissions requirements, but these claims ignore the fact that the standards adjust automatically to changes in the market by allowing larger vehicles to consume more fuel and emit more climate-warming gases. Manufacturers won’t have a harder time complying with the standards if they sell bigger vehicles – unless their vehicles are inefficient for their size and type. Source: Data from http://www3.epa.gov/otaq/climate/documents/420r15026.pdf, Table A4. The Paris climate conference focused attention at the highest levels on reducing total GHG emissions globally. 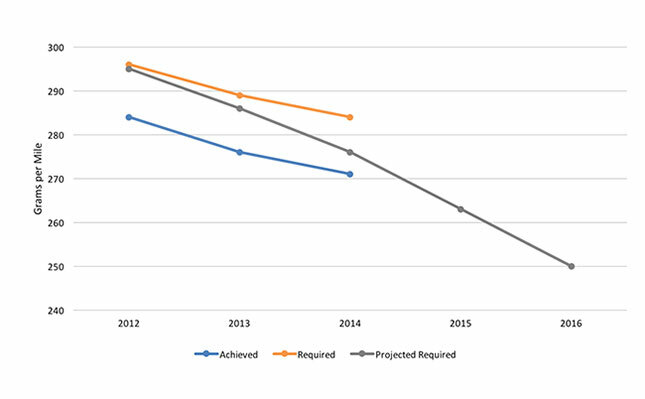 From that perspective, the gray line in the figure above, which shows average greenhouse gas emissions requirements as projected when the standards were adopted in 2010, highlights a challenge for the transportation sector. Required values (orange) for 2013-14 are less demanding than projected (gray), largely because the standards adjust to the size and type of vehicle sold. And the discrepancy between projected and actual requirements is increasing as sales of bigger vehicles grows. Average emissions (blue) remain lower than the rule’s projected requirements, but that advantage nearly vanished in model year 2014, and the trend is not encouraging. Moreover, that advantage disappears altogether if we take away the credits manufacturers receive for producing flex-fuel vehicles (FFVs) that can run on ethanol (E85). Those vehicles in fact run almost entirely on gasoline and hence deliver no real reductions in petroleum consumption or greenhouse gas emissions. Some manufacturers are relying heavily on those paper reductions in greenhouse gas emissions; without them, the gap between achieved values and the projected requirement disappears altogether in 2015. EPA and the National Highway Traffic Safety Administration have embarked on a mandatory “midterm review” of the fuel economy and GHG emissions standards in place out to 2025. The recent data indicate that the program should pass muster from a technological and structural perspective: it’s working well and driving technology improvements at a manageable clip—the industry is both complying and thriving. At the same time, the trend is towards a shortfall in what we ultimately need in the coming years: dramatic, absolute reduction in greenhouse gas emissions and fuel consumption. Long-term priorities dictate that, in the midterm review, the agencies take a hard look at current advances in vehicle technologies and see whether more can be done to ensure absolute efficiency gains at a robust rate, even in the face of market shifts towards larger vehicles.